The ‘endless plains’ stretched ahead of us. Tranquil. Seemingly light years from the stressful demands of our life in the big city. The passage of time marked only by the movement of the sun. We were aware by now, after our dawn to dusk game drives in Tarangire and Ngorongoro, that the tranquility conceals a dynamic eco system where the pressures of survival outweigh a placid existence. Where life is hard. Where letting one’s guard down can only mean certain death. Swift, only for the more fortunate. That is a fact. Life depends on death. And the predator-prey tango is a necessity. But it isn’t easy to watch. Fascinating, awe inspiring even, but not easy. The rest of the herd kicked up such a ruckus that the young stray rushed back into their fold, and my heartbeat returned to normal. The lions, it seems, were just doing a trial run! I wondered for a moment about the heart health of these poor creatures. 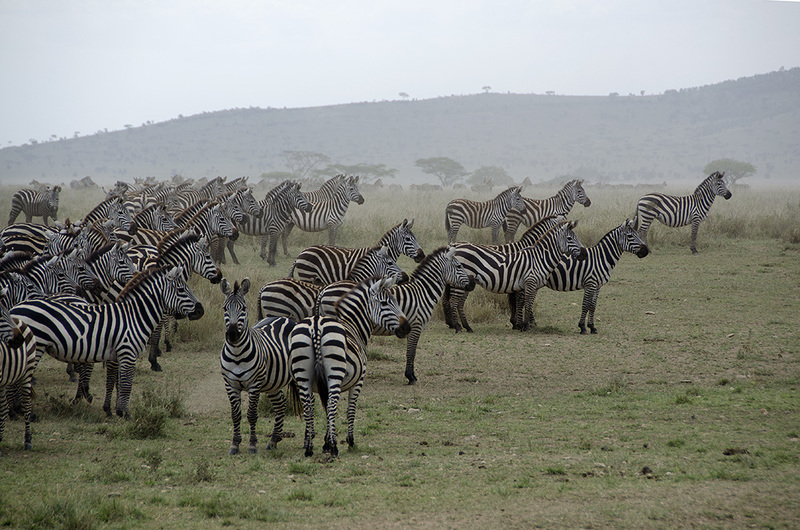 A zeal of zebras on full alert mode!! Midway through our safari we had begun discussing a (future) return to Southern Serengeti in the lean months of Feb/March, to witness the spectacle of synchronised birthing by tens of thousands of wildebeest. An evolutionary adaptation perfected over countless generations, that utilizes massive numbers to counter predation. There is no denying that the big cats get treated to effortless ‘buffet’ spreads over the three week period, but still, more calves apparently survive in this collective process, than they would with staggered year round calving. On our last evening at our camp in Northern Serengeti, conversation veered to the amazing predator action during the calving season, with graphic descriptions of new born calves attaching themselves to lions still feeding off the fresh carcasses of their mothers. “You still want to go?” R laughed. I really do. But I think I might end up testing God’s patience along with that of our dear guide George. PS: Our eight night Tanzanian safari across three national parks was efficiently organised by The Wild Source. And we have only good things to say about the abilities and sensitivity of our guide and driver George. Thank you for the re-blog Jueseppi. Zebras are amazing, and so are your photos. What a challenge to observe ‘nature red in tooth and claw’. I think I’d be hiding my eyes. Thank you again for a journey beyond where I’d go! Tennyson captures and conveys the essence of the experience in far fewer words 🙂 Thank YOU for your visit and comment Meg. Beautiful – I realized myself walking to the Safari in Africa – Just joyful and energetic Post! There doesn’t seem to have been much activity of late over at your blog. Hope all is well with you Niranjan. Deadly…the predators on the look…yes, the prey on the alert and you can see from the Zebras look…life is not easy in the open. Amazing footage. I never cease to marvel at your propensity to pick the right shots, the right angles and of course, the right places to visit… you were born to travel and regale us with the wonders of life in all its myriad colors. Thanks for this awesome post. Thank you dear Meenakshi. This is hardly the kind of ‘word song’ you use to bewitch us 🙂 Your latest is exquisite. So many zebras together is a wonderful sight. I suppose its because they are pretty that the idea of them as lion lunch is far worse than a wildebeest or antelope. Your video is great too Madhu! Bless you, I can’t start to imagine what your shots would look like if you had a tele lens!!! The video is most amusing too. Zebras sound a lot like donkeys. Thank you, Madhu. I wish I had been there in person, but this is the next good thing. Much appreciated! Wow, what an experience. Thanks for sharing your photos with us and the cycle of life in pictures. 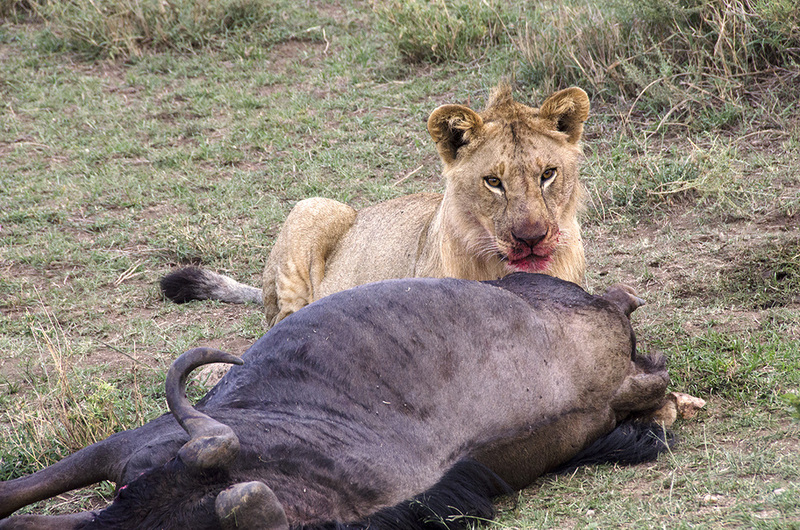 I showed my students a National Geographic photographers DVD and they all were appalled at “the kill scene” of lions devouring a zebra but I asked them if they eat hamburgers and reminded them that the lions don’t shop at the grocery store meat counter. They seem to have trouble taking it in. I am going to show them your video, Madhu. Thanks. Thank you very much Ruth. Would love to know how your students react to the zebras’ obvious distress. I once watched a documentary on a hare being chased by a fox. When the hare managed to escape there was a relief, I must say. But then the narrator or host said that with their mother’s failure to catch a prey, that day the cubs had to survive through the night with only a little bit of food. It’s a reality of the nature, but one thing we can learn is that whether it’s fox or lion or any other predators, they only take what they need. I really enjoyed this post, Madhu! And you took some great images too. What a joy to sit in our armchairs and join you on your great safari, Madhu. All the images are wonderful, but we think the zebras are our favourites. Just love the video! 🙂 Oh dear, Siri and Selma want to go an a safari as week now. How many shots have you taken altogether during those 8 days, do you know? Have a wonderful, cozy weekend. I am guessing that the impassiveness with which I watch wildlife documentaries will be very much tested if I was there in person… Great pictures! These poignant life experiences are breathless moments between the intersection of nature and human nature. To witness life in the raw is vital to understand the universe in which we inhabit. How fortunate you are. So very true Sally. And I do count my blessings. Madhu, your words really are a treat to read always! Hats off! Madhu, beautifully haunting captures of predator and prey relationships. I don’t know if I could return to watch the wildebeest …the synchronized birthing I could watch in fascination…the lions watching and waiting for their next meal…I don’t think so. Thanks Debbie.I wouldn’t have the stomach to watch the carnage either. Such an amazing experience Madhu. I am sure the experience was thousand fold more riveting than watch it on a documentary. It certainly was Colline. Even though we never really saw an actual kill. One of the places on my wish list… someday soon! I hope you do Ishita. Experiencing it with your daughters will be especially enjoyable. We wished we had brought our grandsons with us. You have grandsons Madhu? Are you serious? I’d never heard of the synchronised birthing event, Madhu, but it seems to make good sense (and nature’s pretty good at that, isn’t she?) It’s such a tussle between the good guys and the predators! I want them both to win 🙂 But I have to admit to being squeamish, so ‘in the flesh’ might not be for me. Brilliant share! It’s a bit like watching an old mafia flick Jo, where the dishy (anti) hero beguiles you even as he goes round shooting all his victims 😀 Not for the squeamish! You said it perfectly, Madhu. Life depends on death. It’s not pleasant to watch, but it is nature. Your zebra video with the sounds brought back a flood of memories. It is a hard sound to describe. Watching Wildebeasts delivering babies on the run while lions crouched nearby was difficult for Ron and I. but our guide, like yours, always put it into perspective. It was even louder before I decided to record it Marina. Their distress heightened our squeamishness. A silent kill would be easier. I think 🙂 Many thanks for your support. Thanks Cathy. Happy holidays to you too. Will you be spending Christmas in China? Loved the text part too. you have beautifully brought out the balance, the necessity and feelings of onlookers in the wilderness.Whatever might be the context, life is the game of balance. specially loved the first pic….the jungle drama caught at it’s best. Well, not exactly crappy, but not quite what you would pick for quality either 🙂 It is the most practical though for the kind of photos I click most often, so it didn’t make sense to upgrade while we had so many bills to pay. Thank you very much for the thumbs up Sue. I had stepped away from WP for awhile. I had no idea you were on such a fantastic adventure! I will follow each day! It was nice to hear what I think was the sound of your voice in the video! Spectacular footage and photos! I am so envious! The circle of life captured in raw footage yet keeps the planet in balance. Spectacular Madhu! Madhu, the sight of all those zebras must have been amazing – I had no idea what they sounded like until I watched your video. As for the lions, vultures and hyenas, they certainly don’t seem to be camera shy either. 🙂 The Serengeti has long been on my wish list for Africa… thanks for giving us a glimpse of its grandeur in this beautiful, concise account! I hadn’t heard Zebras barking (braying?) before either James. And to have this huge herd ‘complain’ loudly and simultaneously was mesmerising! I too was struck by the cycle of life and death, which is nowhere as apparent as it is on safari. We saw a very graphic kill of an impala by a leopard, who in very short order lost his feast to a viscious pack of hyenas which promptly tore the poor impala apart at the seams. We also saw a mother leopard with a fresh kill feeding her cub in a tree to protect against scavengers. One feels so bad for the prey but as you say, for them it is survival. I think an African Safari should be a mandatory experience for every living person. If only it could be so Madhu. Thanks for the reminder of some extraordinary memories. Tina, extraordinary is the right word. And nowhere is it quite as memorable as in Africa. I was never much of a wildlife person, despite my father in law heading the forest department in our state for over a decade. Now I am hooked. Wish it was more affordable though. Amen to that! But I talked to them about that and they said it’s actually a way of controlling the number of people which helps protect the pristine nature while still generating the revenue they need to sustain it. That made sense to me. It sure does. Central Serengeti and Ngorongoro is over crowded as it is. And I hear Masai Mara in Kenya is too. A fascinating and informative narrative and fabulous images Madhu. I’d love to see some of these animals in the wild for myself some day. PS Thanks for the nod on my site being down recently, much appreciated. Thank you Suzanne. And you are most welcome. The comment section was behaving strangely yesterday, have a feeling all might still not be OK.
PS: Was wondering, do you have a web developer maintaining your site, or do you handle all the ‘chores’ yourself? I know I need to take the plunge sometime soon, but I am dreading having to find more time to devote to all of that. That video really put me right there with you, Madhu. Your photos are always awesome in transporting me to where you are, but this video really made me feel present. Madhu, just so you know and can view, I sent this post to Twitter which was picked up by a Twitter site on Africa http://paper.li/EyeonAfrica2012/1345500139. You can find your post under the Leisure section. Thank you very much for the share Angeline. Much appreciated. Nature feeds on itself for survival. 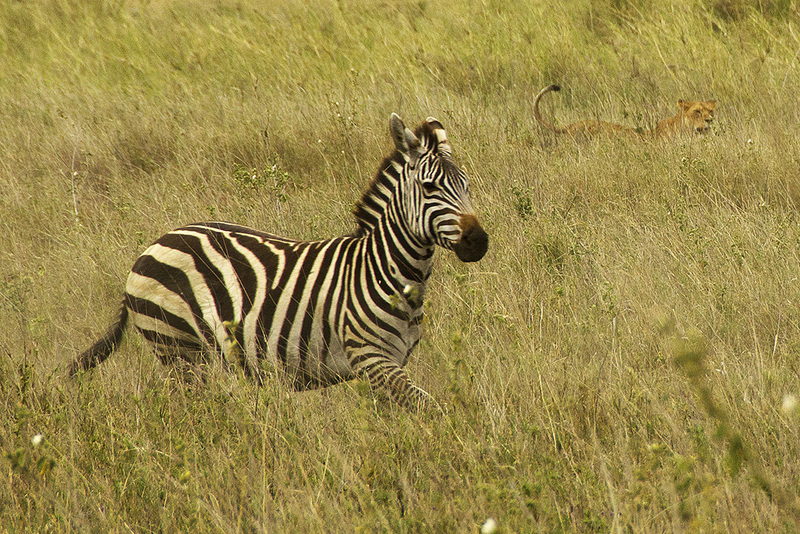 The photograph of the unsuspecting young Zebra and the lioness stalking her prey is indeed fascinating! I rate this as a rare and brilliant capture Madhu. Thank you so much. Thanks Dilip. You might need to unfollow and follow again if notifications don’t show up. Peace and tranquility for some… a daily struggle for survival for others. I wonder what these creatures would think if they visited our urban jungles… would they scoff at the artificial struggles we create? That first shot is an amazing capture, Madhu. How fascinating to have witnessed it. Synchronized birthing? Didn’t know about this… would be quite something to witness, eh? We are already dreaming of returning during the birthing season Kan.
Not a jungle out there for nothing Madhu . . . . gorgeous shots! what was the cost of this safari when you had gone? I am planning to go this year.